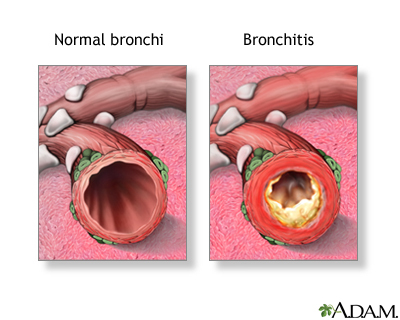 Acute bronchitis is swelling and inflamed tissue in the main passages that carry air to the lungs. This swelling narrows the airways, which makes it harder to breathe. Other symptoms of bronchitis are a cough and coughing up mucus. Acute means the symptoms have been present only for a short time. When acute bronchitis occurs, it almost always comes after having a cold or flu-like illness. 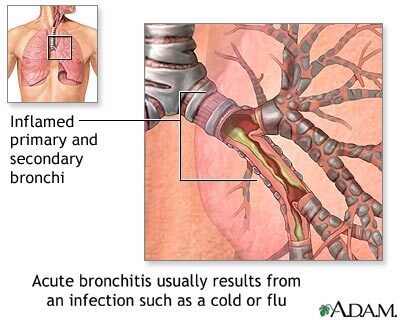 The bronchitis infection is caused by a virus. At first, it affects your nose, sinuses, and throat. Then it spreads to the airways that lead to your lungs. Sometimes, bacteria also infect your airways. This is more common in people with COPD. 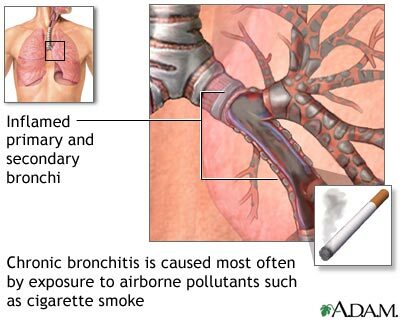 Chronic bronchitis is a long-term condition. To be diagnosed with chronic bronchitis, you must have a cough with mucus on most days for at least 3 months. Even after acute bronchitis has cleared, you may have a dry, nagging cough that lasts for 1 to 4 weeks. Sometimes it can be hard to know if you have pneumonia or bronchitis. If you have pneumonia, you are more likely to have a high fever and chills, feel sicker, or be more short of breath. Your health care provider will listen to the breathing sounds in your lungs with a stethoscope. Your breathing may sound abnormal or rough. If you have asthma or another chronic lung condition, use your inhaler. Take aspirin or acetaminophen if you have a fever. DO NOT give aspirin to children. Breathe moist air by using a humidifier or steaming up the bathroom. Certain medicines that you can buy without a prescription can help break up or loosen mucus. Look for the word "guaifenesin" on the label. Ask the pharmacist for help finding it. If your symptoms do not improve or if you are wheezing, your provider may prescribe an inhaler to open your airways. If your provider thinks you also have bacteria in your airways, they may prescribe antibiotics. This medicine will only get rid of bacteria, not viruses. Your provider may also prescribe corticosteroid medicine to reduce swelling in your lungs. If you have the flu and it is caught in the first 48 hours after getting sick, your provider might also prescribe antiviral medicine. Wash your hands (and your children's hands) often to avoid spreading viruses and other germs. Except for the cough, symptoms usually go away in 7 to 10 days if you do not have a lung disorder. Walsh EE. Acute bronchitis. In: Bennett JE, Dolin R, Blaser MJ, eds. Mandell, Douglas and Bennett's Principles and Practice of Infectious Diseases, Updated Edition. 8th ed. Philadelphia, PA: Elsevier Saunders; 2015:chap 66. Wenzel RP. 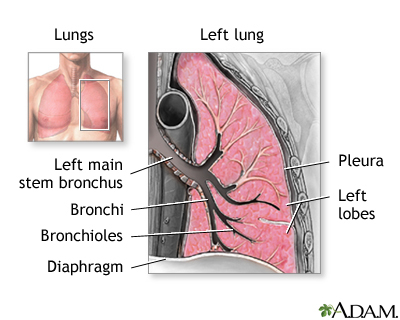 Acute bronchitis and tracheitis. In: Goldman L, Schafer AI, eds. Goldman-Cecil Medicine. 25th ed. Philadelphia, PA: Elsevier Saunders; 2016:chap 96.